This week’s episode of Grand Designs on Channel 4 featured a pair of first-time renovators turning a cow shed into a warm, cosy home. Kevin McCloud visited Somerset to see the progress and help out with the self-build. 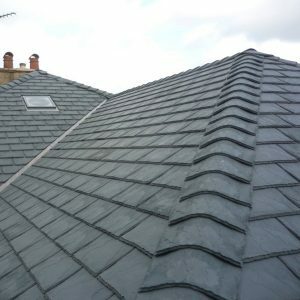 They used the fantastic slate replacement Eco Slate, which is 100% recycled and becoming extremely popular in the roofing market. Eco Slate is a 100% recycled alternative to traditional roofing slates. Made of recycled plastic, it offers a strong, pliable, attractive roofing option for your home or other building application. Eco Slate is quick and easy to install, self-bonding and lightweight. It is therefore ideal for low pitches. Catch up on the latest Grand Designs episode if you missed it on All 4 here. Eco Slate is available at Roofing Superstore now, and you can even order a sample to check it out first. If you need any advice or information on Eco Slate or other slate alternatives, call our friendly team of advisers on 01752 692 760. Alternatively, use the live chat function in the bottom right-hand corner of our website.